CSUSB hosted the United States Air Force 70th birthday celebration on Friday, September 29 in the Recital Hall’s Performing Arts Building. The event began with Cadet Major Joshua Arnold welcoming everyone. “We are reminded of our proud heritage,” stated Arnold during his welcoming speech. The event brought everyone together to celebrate 70 years of the United States Air Force. “The Air Force is the youngest service. It is the World Premier Aerospace force,” explained Sgt. 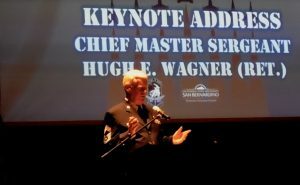 Hugh E. Wagner, the Keynote Speaker during the event. As Wagner spoke about his time in the Air Force, a slideshow with pictures exhibited how he got to travel the world during his service in the Air Force. Augustin Ramirez, who is the Interim Director of the Veterans Success Center here at Cal State San Bernardino, explained the focus of what the speakers emphasized. Following the keynote speaker, attendees proceeded outside for the viewing of a T-34 flyover which took place in front of the Performing Arts Building. Munoz will be the first in her family to join the Air Force. When it came to the coordinating of events, William Lewis, who is the Assistant Support Coordinator, was pleased with the results. “I feel immense pride in events such as these. As a member of the Air Force participating and coordinating this event reminds me of the important concepts of life and shows me that the community engagement is good for both the members of the Air Force and the civilian community which we protect,” stated Lewis.